Suicide Squad Spinoffs Planned for Joker & Captain Boomerang? We still have just over three months until Suicide Squad hits theaters, but there have already been numerous reports about Warner Bros. prepping several different projects based on this upcoming movie. Back in March, a report surfaced that Warner Bros. wants writer-director David Ayer back for Suicide Squad 2, along with Will Smith as Deadshot and presumably the rest of the main cast. That report claimed that shooting could start in early 2017, but that was never confirmed. Just last week, it was confirmed that a Harley Quinn spinoff is moving forward with Margot Robbie reprising her role in a movie that would also include female DC characters like Batgirl and the Birds of Prey. 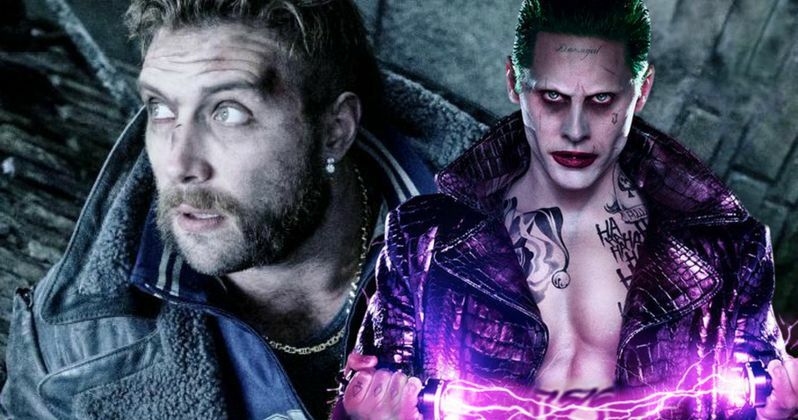 Today we have yet another report that claims Warner Bros. is delving even deeper into Suicide Squad by developing two more spinoffs based on The Joker (Jared Leto) and Captain Boomerang (Jai Courtney). This new report comes from We Got This Covered, whose source claims that the Suicide Squad 2 sequel is definitely happening, and the studio is very confident that the movie will be a huge hit. As for the spinoffs, nothing is locked in quite yet, but Jared Leto is reportedly interested in starring in his own Joker movie. Here's what the site's unnamed source had to say below. "They're going to do a sequel for sure, and the recently announced spinoff with Margot Robbie has got everyone excited, too, but their plans don't end there. The studio is feeling very confident in the property. They think it's going to be a really big hit and they think audiences are going to fall in love with these characters. I've heard more than a few talks of giving some of the other Task Force X members their own spinoffs, and like the Harley Quinn one, these films would open the door for a ton of new DC characters to show up. The Joker is a definite possibility for a spinoff, and Jared [Leto] seems up for it from what I've been told. They're also really hot on Jai Courtney's character Boomerang right now. Nothing's set in stone yet, but you're definitely going to be seeing a lot more of these guys in the years to come." This report comes just days after Warner Bros. established DC Films, which will be run by DC chief content officer Geoff Johns and Warner Bros.' executive vice president Jon Berg. The studio reportedly formed this superhero movie division as part of a larger re-structuring within the entire studio, coming in the aftermath of Batman v Superman, which has fared well at the box office ($870.9 million worldwide), but was also trashed by many fans and critics alike. Geoff Johns is also co-writing a stand alone Batman movie with Ben Affleck, who is reportedly set to star, direct and produce the movie. Suicide Squad also features an ensemble cast that includes Cara Delevingne as Enchantress, Joel Kinnaman as Rick Flagg, Karen Fukuhara as Katana, Adewale Akinnuoye-Agbaje as Killer Croc, Jay Hernandez as El Diablo, Adam Beach as Slipknot and Viola Davis as Amanda Waller. If Suicide Squad is successful enough, it's possible that these characters could get spinoffs as well, or they may also be used in any number of the future movies already set up within the DCEU. We'll be sure to keep you posted as soon as we find out more about these proposed Joker and Captain Boomerang spinoffs from Suicide Squad.